Maybe think about it another way. . . I have been looking at Psalm 59 for a couple of days now. I was thinking if I had anything to say about another psalm talking about “enemies”. Then I thought about it differently. One of the difficulties in my life is thoughts that sap my energy. Not BIG, “Oh my Gosh” thoughts, just annoying, “life is hard” thoughts. Things like, a friend in the hospital, a situation that did not work out as I thought it would, reports to be finished, uncertainty about what is up ahead in my life. . . I realized that these energy sapping thoughts can be the enemy. I don’t want to trivialize what happened to the writer of the psalm or their experience. I think it is important to understand the actually dangers that God’s people faced. Yet, this psalm is very personal. So, when I think about those who are personally against me, I think about how I often become my own worst enemy. I truly want God to rescue me from mental energy spent on unhelpful stress. defend me from these mutineers. save me from their hit men. Those thoughts really do gang up on me, hid from me to ambush me when I am not ready to defend myself. Those thoughts can generate doubt and despair and God must battle them. they’re hiding in ambush for me. crossed no one, wronged no one. don’t be soft on these hard cases. God is the one who must move into action against the unhelpful mental life that often becomes most powerful during those late evening hours. Those mental loops run over and over again and sometimes it feels like they will never get caught. They howl like coyotes, ringing the city. Snarling invective, drawn daggers in their teeth. They think they’ll never get caught. you treat the godless nations like jokes. shows me my enemies in ruin. It is God who can transform our thoughts. And, my experience is, it is not quick work! Again and again, we have to turn those thoughts over to God to be changed. take them apart piece by piece. Finish them off in fine style! Finish them off for good! everywhere that God’s in charge. And bite the hand that feeds them. I need to remember that God has the power to transform; that it is only the present moment I can effect; that God will be with me through it all. Yea! It is God I trust. a good place to hide. I pray you can find God’s dependable love in this day. I pray you can let God reign in your thoughts to give you peace. I know God can do it if I lean on God. Psalm 58 is perfect for our political lives these days. The writer is venting about those in power who are not caring for “the common good”. The psalmist expressive anger will probably NOT help to “reach across the aisle”, but sometimes it is the way we feel about those who do not agree with our political views. 1-2 Is this any way to run a country? Is there an honest politician in the house? behind closed doors you make deals with demons. their first words out of the womb are lies. decades of wax built up in their ears. The description of the people is that they lie and do not listen is clear. “Decades of wax built up in their ears”; what a great image. It is those in power who have no integrity and are not responsive to the needs of the community that stand accused. Often in our culture those who take political office use that power for their own purposes. I imagine that in the time of the psalmist that political dishonesty was a levels far beyond what we have ever experienced. Yet, in the scripture, there is a call for honesty and integrity for those who rule the people. all that’s left, a damp stain in the sand. worn smooth by the traffic. be a miscarried fetus that never sees sunlight. throw it out with the garbage! Everyone cheering, “It’s worth it to play by the rules! As we have experienced the smooth continuation of power for our country, we can give thanks to our faithful God. Even through the decisions made in the political realm of our lives might not be to our liking, we can voice our concerns, we can gather others to change systems we believe need changing, we can openly worship God in whatever way speaks to us. I encourage you to give a prayer of thanks today. Our system of government is far from prefect, but we have the power to change our lives and lives of those whom God cares for deeply. As I read over Psalm 57, a song from my Youth Choir days came into head. Days of my youth were difficult at times and I remember the idea of running to God to be hidden under God’s wing. The writer of this psalm tells of this same desire to escape the pain of life. It is God we can run to, it is God we can trust. This psalm is just eleven verses, so enjoy. 1-3 Be good to me, God—and now! I’ve run to you for dear life. Did you like the line about having a mantrap dug to catch the writer? I wonder if it is different than a womantrap? There are two more verses to this hymn, but these are the two verses that still stick in my head. Like I said, those teen years were tough and it helped me to know that God was always there to hold me up. I think during those hard years that I leaned so heavily on God that when life was hard in subsequent years it didn’t seem so bad. God is always that ready to hold you and hide you in God’s wings. I think also knowing that I am deeply loved by God is the truth that holds me up each day. I can’t believe how long it has been since I have written on my blog. Life has been busy. I have painted my room and got a new bed. Dad has had a “routine check” with most of his doctors. 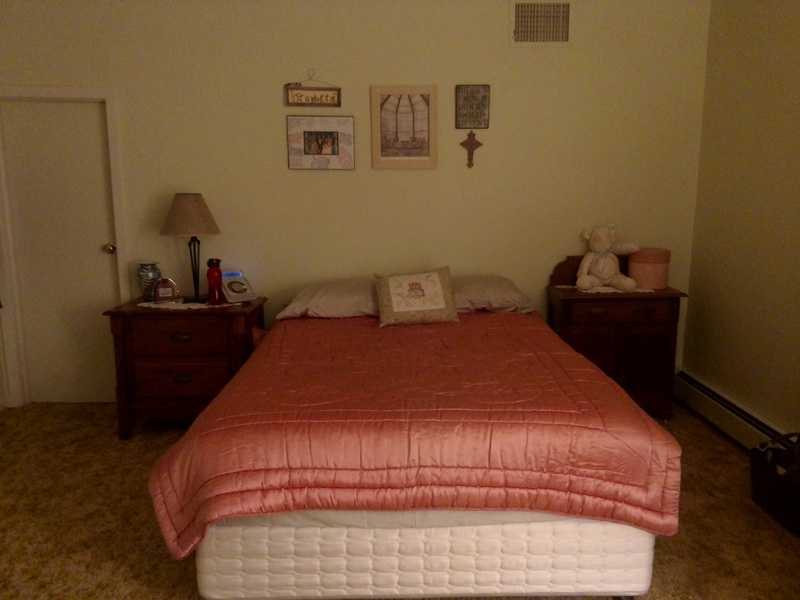 If I can get a picture to attach to my post, I’ll show you my room (it is painted in a nice soft green). So, on with the psalms. Psalm 56 finds the writer upset by those who are pursuing them and asking God for help. wait their chance to get me. 7 Pay them back in evil! This passage about God’s total awareness of our life struggles with particularly poignant. Think about what it means that God has kept track of all our tears and all our pain. Perhaps the next time you are in that place of tears and pain you can imagine God standing with you; holding you through the brokenness of life. that God is on my side. The writer ends, as most psalms do, with a shout out to God. This praise of God brings in to perspective the vast difference between a God of is there for us and human beings who can often choose badly in life. It is God who has the real power, healing, strength and hope of our lives. I believe that, if God and I are in a good place, then the rest of my life will be OK. Praising God is the best. I hope you can find something to praise God for today. If it is tough to praise God today, I pray you can feel the presence of God which is always there to count each tear. Psalm 55 expresses pain that we have not seen in the earlier psalms. The writes is appealing to God because they are under a slanderous attack from a friend. The writer appeals with passion for God’s help. don’t pretend you don’t hear me knocking. As the writer calls for God’s decisive action, they talk about the division that have been created in the city. I think about local church were people have chosen sides and divided church. These divisions cause conflict, stress, and draw focus away from the grace of God. 9-11 Come down hard, Lord—slit their tongues. It is difficult to be betrayed by anyone, but how much harder it is to be deceived by someone close to you. Can you understand the deep emotion of this psalm as the writer lives the pain abandonment. feel every desolate detail of a damned life. deep sighs—he hears, he rescues. are lined up against me. puts them in their place. they pay him no mind. The answer for the writer is the answer for all of us. To call on God. To look to God for judgement and know that it is God’s job to “put them in their place.” Even though the writer has no hope that ones who have caused damage will listen to God, it does not stop the writer from believing in God’s power. I love the imagine of piling our troubles on God’s shoulders. God will carry our load and make sure we do not fall. As I have said before, I really don’t think God needs to “throw the others into a muddy bog”. I think their own inauthentic and unfaithful lives will destroy them more effectively than anything else. It is God I always trust. Even when life is not like I planned . . even when those I thought I could count on aren’t . . . even when I am in uncharted territory. . I will trust in God. Peace. Well, just a few days in to the new year, and I missed a day. Yesterday was a long one. I am having a great time being in ministry again. The church I am serving is has been though some hard times. I think of them as I read the psalm of the day – Psalm 54. The writer beings with appeal to God for help. I know a lot of my days have started this way. We all have a need for God to help out of messes that confound out lives. 1-2 God, for your sake, help me! Use your influence to clear me. Don’t be too busy to hear me. The writer is having trouble with a killer. This has never been my problem. However, I have had people carry mean stories about me, or be angry with a decision I made, or just have people who make it unpleasant to be around. hit men are trying to kill me. God means nothing to them. The writer affirms that even we feel life is out to get us, God is right there ready to help. God will give us the path to walk through the difficult times, away from those who could hurt us, and towards a God-filled future. 4-5 Oh, look! God’s right here helping! Evil is looping back on my enemies. Don’t let up! Finish them off! Our response to God guiding is worship. Our response to the gift of each new day is worship. Our response to being human and knowing our creator is worship. We are creature given breath, so we can sing to God. 6-7 I’m ready now to worship, so ready. I thank you, God—you’re so good. and I saw my enemies get it. Have I told you lately how much I love Eugene Peterson’s paraphrase of the scripture. Psalm 53 is awesome. I hope it gets creative brain going and thinking about who we are as people on the planet and as God’s people. The first verses express wonderfully the reality that there are always those who will say that God is dead. I love the line that says God is looking for someone who is not stupid. God is looking for people who are activity looking for the presence of God. Of course, God is still looking for those people. The next verses are a little depressing. It says that God cannot find faithful people. Even though I don’t think that is true, I do like the image of verse 3 – “useless, unshepherded sheep, taking turns pretending to be Shepherd.” Sometimes I feel like this is a great description of the church. There are faith community who do not want to do the hard work of spiritual disciplines which helps us to live our obedience to God. But only want to drop in and have a ‘meaningful’ experience for an hour on Sunday morning. The psalmist has harsh words for the people pretending to be the Shepherd. The line, “treating people like a fast-food meal over which they are too busy to pray.” is incredible. I think it will bounce around in my brain for days to come. The hope that it offered by the psalmist is the same refrain that comes from all the prophets. Those who “turn-around” will find joy. It is the turning around, the turning back to the way of God that brings life. How often do we think that we a plunking OK and there is really no reason to change our lives. Are we willing to settle for an OK? Are we willing settle for being our own inadequate shepherd, rather than following the real Shepherd? My prayer is that you will be one of the ones turning around and find yourself skipping rope and singing with laughter.